I have the data as follows and whatever I tried I can't make the new formula column a numeric one. Your decimal place separator is a comma, you may need to change it to a full stop for num() to work. I have to, being in the UK. Your local preferences may allow you to work with the comma. Also, using substr() will work only if all your parity values have the same number of digits. If the number of digits increases, it will crop the value, and if the number of digits decreases, the substr() will keep some of the USD characters and num() won't work at all. I suggest you use substitute() instead of substr() to replace "USD" by nothing, and replace "," by "." You need to take the "USD" out of the data in the rows. JMP sees this as character data and will not allow you to change to numeric. You will need to a Find and replace or a Recode to try and make the change a little easier on yourself with over 1400 rows. Hope this fixes your problem. Surround what you have with num(). That will convert a string to a number. 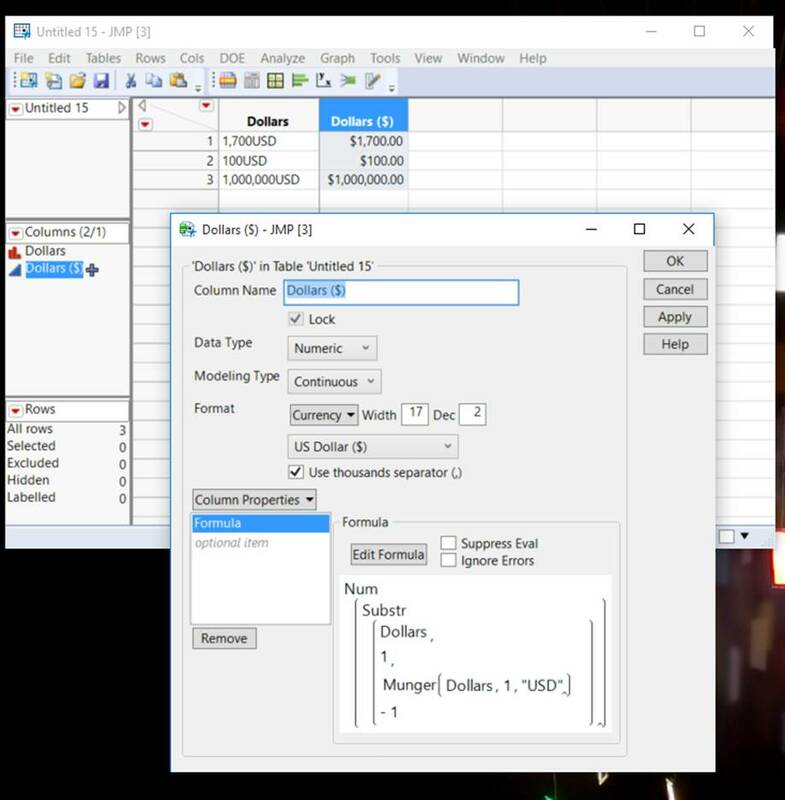 And if you want to add the currency, just go to column info and add to column property "Units" the value "USD", you will get the Units in brackets after the column Name. Only changing all the commas to full stops solved the problem on its own with substract function but with substitute function it is safer in case shorter than 5 decimals displayed data (1.50000 »» 1.5). Not to beat a dead horse but you can still use the Num(Substr(….) option by doing the following.